Rochester, NY (March 19, 2019) – Head-on collisions take place far too often on our roadways. Unfortunately, they are also one of the most serious types of accidents. 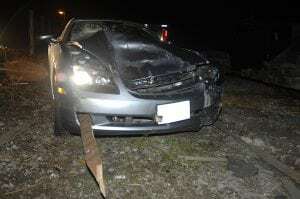 Rochester Police were called to the scene of a head-on collision that took place last night, March 16th, around 10:00 p.m. and led to injuries in one party. The accident, according to police, happened on Parsells Avenue. Two dark sedans collided with one another when one ended up in the wrong lane. Both vehicles had serious damage to them. Only one party was injured and, luckily, they are expected to recover. At this time, the investigation into the accident is ongoing. Above all else, we would like to take this time to extend our sincerest sympathies to those involved in this serious accident, with the hopes that they will receive full recoveries. As the victim of a serious car accident, you might be faced with the reality of your injuries such as medical bills that you might not be able to handle on your own, lost wages, and more. New York car accidents can be extremely serious in nature and you deserve help during this difficult time. Our accident attorneys at Hach & Rose know how imperative it is to have a legal advocate on your side if you have been injured in the midst of a head-on collision. Head-on collisions are known as some of the most serious types of accidents that take place in New York. If you are now suffering from physical and emotional injuries, you have rights. Please contact us to find out what we can do during this difficult time at 212-779-0057.